Louisiana’s Poet Laureate, Darrell Bourque, shares his favorite eateries. Darrell Bourque grew up in Sunset. His long career as a writer and professor at the University of Louisiana-Lafayette has given him a deep understanding of the region. Bourque was appointed Louisiana Poet Laureate by then-Gov. Kathleen Blanco in 2007 and then reappointed by Gov. Bobby Jindal in 2009. He served in the position through 2011. But his Louisiana accolades continue. On Nov. 1, he was awarded the Louisiana Book Festival Writer Award. “I am the 50th recipient of the award. Earnest Gaines was the first. I am really humbled by the company I’m in,” Bourque says. Along with many other Acadiana residents, when Bourque and his wife are ready for a romantic dinner, they head to Café Vermilionville in Lafayette. While the lovely establishment represents the essence of Louisiana style and sophistication today, the site has a history linked to one of the earliest settlements in the area – years before the Acadians arrived in the area. Situated near the Vermilion River, Café Vermilionville’s roots are anchored in the long-ago time when the river was the chief means of travel for Native Americans, trappers and traders. Originally an inn (the first in the area), it became a private residence in 1853 and was occupied by Union troops during the Civil War. These days, Bourque is among many to agree that the food is consistently good. Highlights of the lunch menu include roasted corn and crab bisque and a wonderful wedge salad, with crispy prosciutto, sun-dried tomatoes, red onion, walnuts with Gorgonzola dressing. The veal tortellini is another lunch favorite. It’s panéed veal, mushroom, cherry tomato and asparagus ragout, shaved Manchego with cheese tortellini. 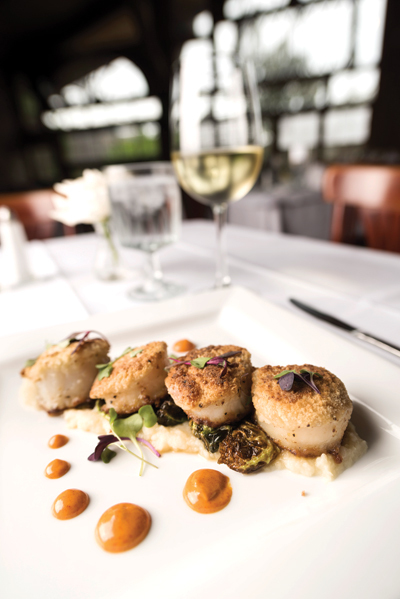 The dinner menu presents an array of choices, but one local favorite is the macadamia crusted scallops, served with celeriac puree, Brussels sprout chips, white truffle oil, smoked paprika and tomato aioli. The combination of aromas and flavors is something special. When Bourque is looking for a restaurant to spend time and eat a meal with his extended family, he heads to Arnaudville to the Little Big Cup. The restaurant, located in Arnaudville, is a blend of rural roots and big city sophistication. 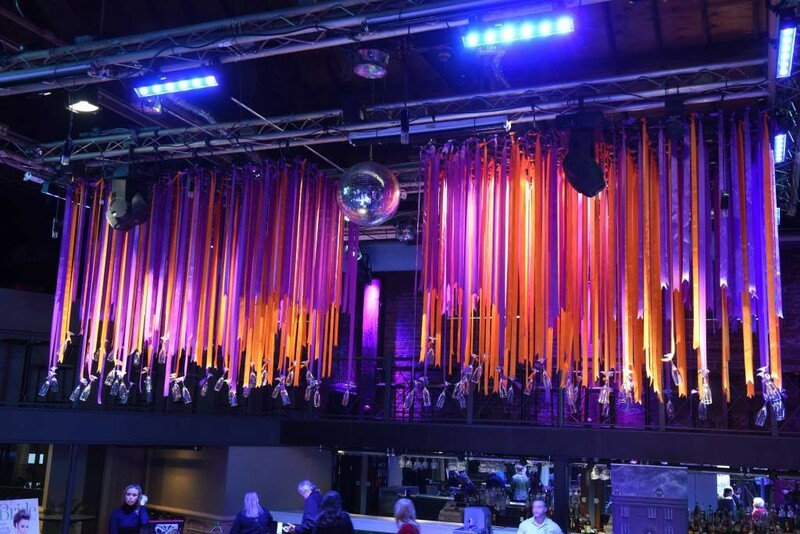 The establishment’s owners, Kevin Robin and Sanjay Maharaj, met in New York City, but Robin has deep Arnaudville roots. Five generations of Robin’s family have run Russell’s Food Center across the street from the restaurant. When they decided to leave the city and move to Arnaudville, Maharaj asked where he would be able to get a good cup of coffee. The pair opened a coffee job, which became one of the most popular restaurants in the area. He’s referring to Cricket Frederick, Little Big Cup’s head waitress and maker of delicious desserts. With great pride, Frederick tells patrons that she’s been a part of the Little Big Cup since Day One. She shares her admiration for Robin and Maharaj — from the food they serve, the Friday and Saturday evening surf and turf buffet and the Sunday brunch. Bourque says he understands the great popularity of the Little Big Cup’s Sunday brunch and buffet, but he prefers eating there during quieter moments. On Friday and nights, the surf-n-turf menu includes an amazing array of dishes – including Gulf fried shrimp, pork shanks, broiled catch of the day served over crab rice, seafood stuffed mushrooms and seafood pasta, Cajun-style catfish courtbouillon, praline chicken, oven-roasted blackened prime rib and a beautiful salad bar. The buffet doesn’t look like a typical buffet. It is displayed with great style, and the color and variety of food boggles the mind. As Louisiana’s Poet Laureate, Bourque traveled the state from north to south and from east to west. In Lake Charles, he discovered the Pujo Street Café. Pujo Street Café’s tilapia Puttanesca is a local favorite. It is a grilled tilapia filet, topped with a traditional Puttanesca sauce, served over angel hair pasta. Another popular pasta dish is the chipotle pepper linguine. It’s a spicy chipotle cream sauce served over linguini with the choice of chicken, crawfish, shrimp or grilled vegetables. The chicken Mykonos is another popular choice at the Pujo Street Café. Made of fresh spinach, feta, Parmesan and panko, stuffed inside a juicy chicken breast and then baked and topped with a feta-cream sauce. Another of Bourque’s Lafayette favorites is Tsunami. Tsunami’s history of great food and service has created a legacy of upping the region’s restaurant game – a rising tide lifts all boats. From their bento boxes to the vast variety of rolls – including the legendary John Breaux roll (spicy crawfish and avocado) or the Don Tuan (tuna, crunchy shrimp, cucumber, topped with snow crab, avocado, graham cracker, Kazan and Sriracha sauce), Tsunami serves up delicious lunches and dinners.